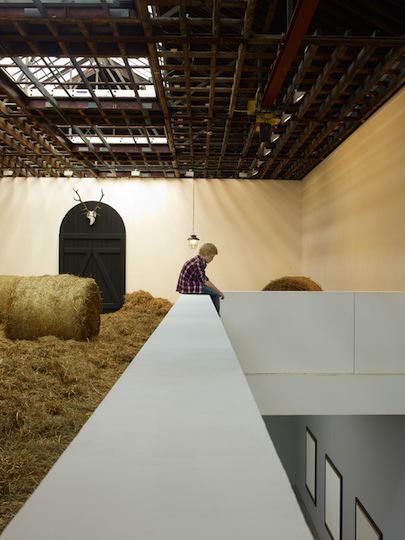 Some might say Scandinavian artist pair Elmgreen & Dragset have done it again. 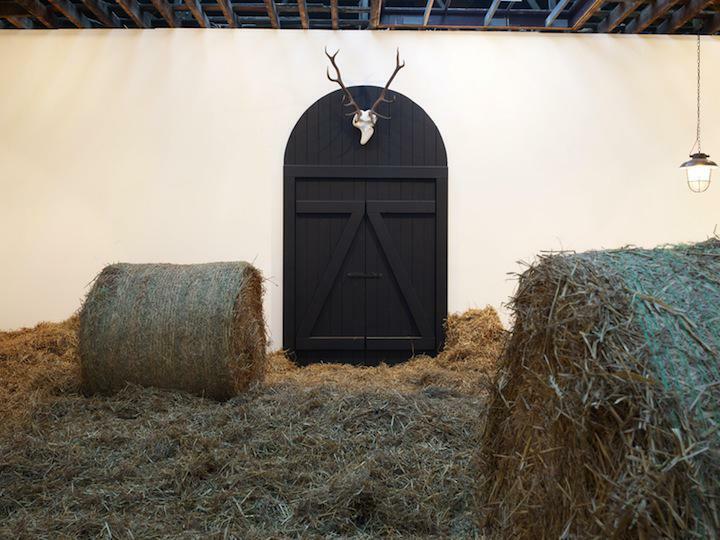 Harvest, an installation comprised of two distinct ‘choreographed environments’ is a two-part statement packing the kind of tag team punch one would expect from this deadpan duo. 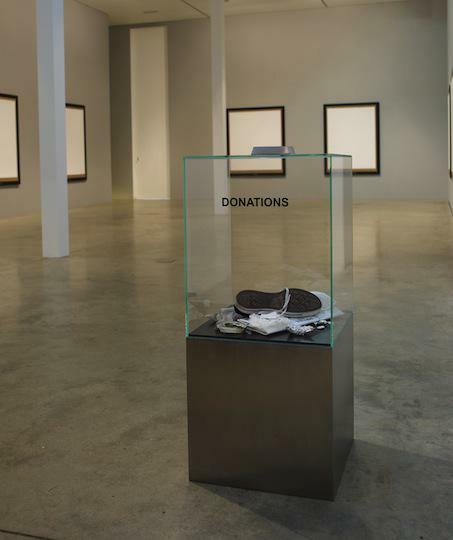 The exhibition begins on the gallery’s first floor, a donation box marking out the entrance to what feels like a museum-like space where eleven identical canvases, each labeled after a prestigious art institution, are reverently hung. 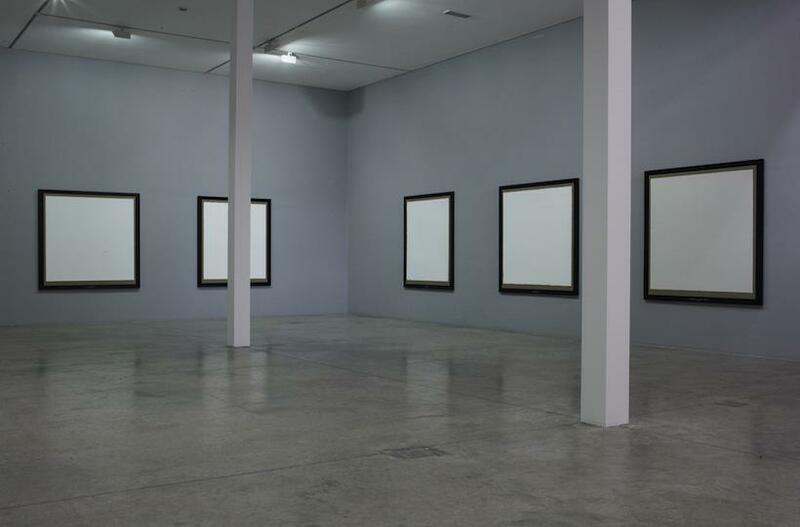 Every canvas bears a seemingly uniform square made of white pigment removed by professional conservators from the walls of the institution each is dedicated to, from the New Museum to Tate Liverpool and the Kunsthalle Fridericianum. 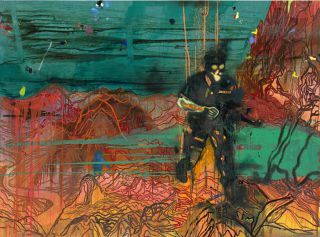 Titled, The Named Series, the work’s visual references are immaculate: from Kazimir Malevich to Robert Rauschenberg, the monochrome, to notions of institutionalized culture, ‘the white cube,’ the museum, and the global art market machine, this is a statement delivered with the clarity of a Richard Prince one liner. 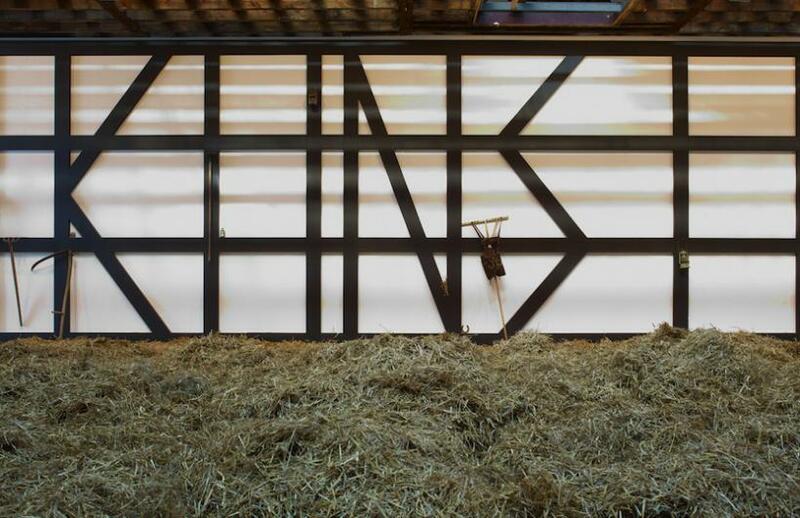 The second floor is an entirely different environment, unfolding over bales of hay cascading over a large space resembling a movie set for a rustic, dystopian psychodrama complete with barn door, gas lamp, pitchfork, and timber beams arranged against the wall to spell out ‘KUNST’ (Art). Overhead, the ceiling has been stripped to reveal the wooden beams supporting the roof of the building. There is a sense of unease here that teeters precariously between something jarring and something more sentimental. 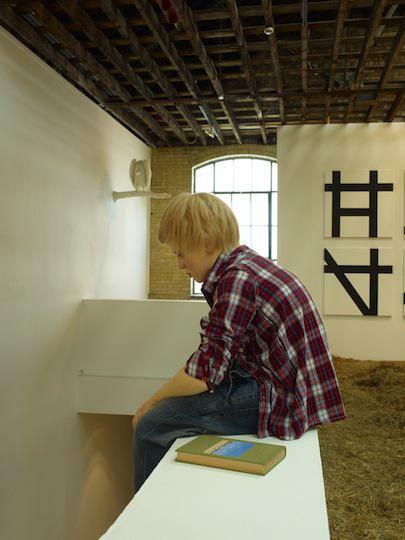 Sat slouched on a ledge overlooking the ground floor beside a book entitled Harvest is Against Nature (2012), a life-sized figurine of a boy who is being watched by a sculpture of a vulture on a branch protruding from the wall above, The Critic (2012), glaring menacingly his way. 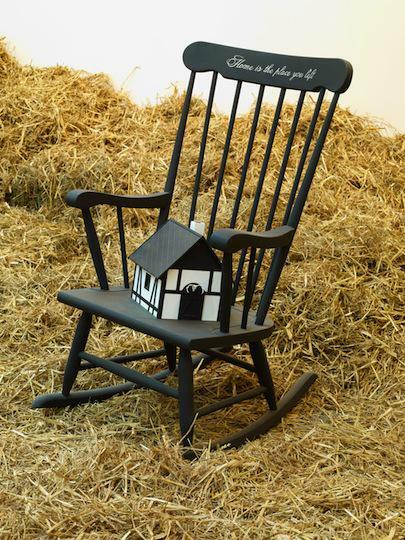 That this boy might be an artist being scrutinized by what Elmgreen and Dragset have evidently likened to a flesh-eating, death-loving predator, is somehow underlined by a model barn resting on a rocking chair nearby, with ‘Home is the place you left’ scrawled ominously across its backrest. 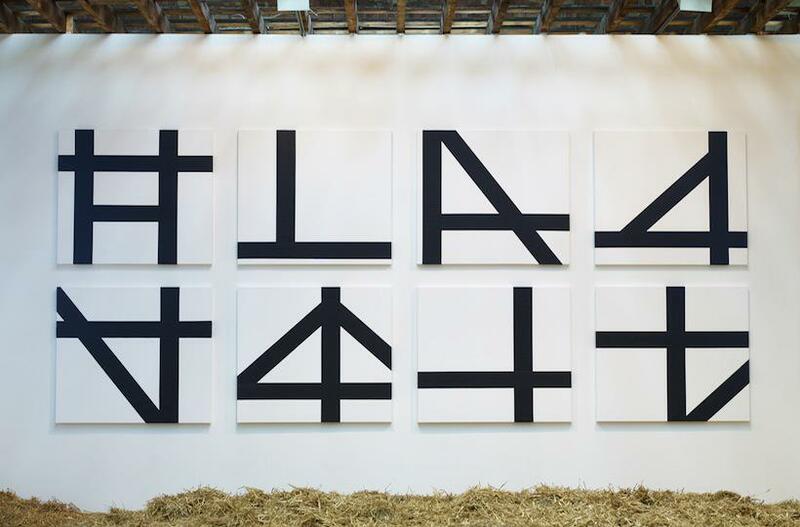 Completing the composition are eight canvases hung on the final wall, their white surfaces intersected by thick black lines in geometric shapes that mirror the wooden beams within the space. In this setting, the boy seems at once vulnerable and complicit; as if he has accepted his fate within the cycle he has found himself in. 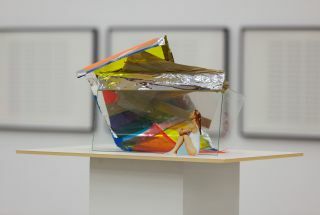 It is a cycle of abstraction, where the notion of home can be transformed into abstract paintings visibly derived from their domestic surroundings presented as esoteric objects for consumption in a commercially-driven space not unlike those institutions portrayed downstairs: the memory of ‘home’ absorbed into the dreams of a white cube. 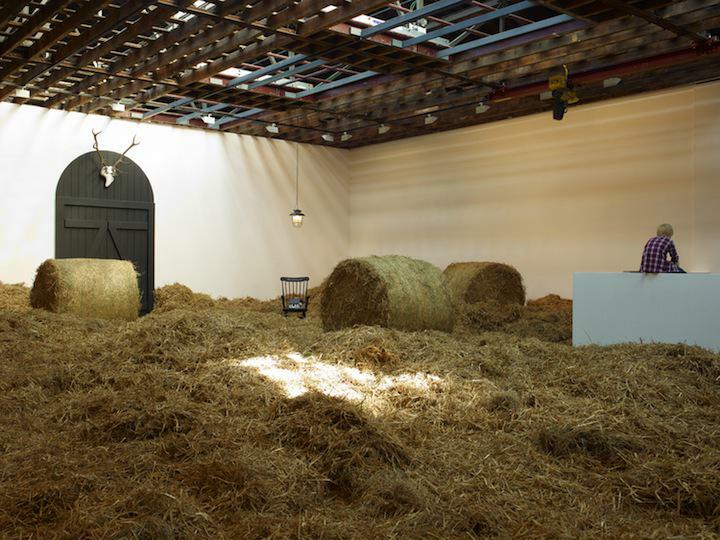 Together, the two environments form a complex, if nebulous, institutional critique delivered with the precision of a well-structured riddle surrounding the production of art simply by revealing the art world’s mechanics. And so what’ Some might say. This is, after all common knowledge; a critique ‘everyone’ is well versed in. 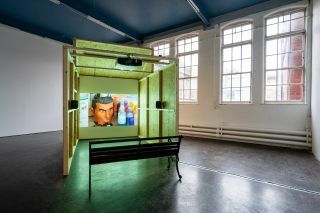 And yet, in creating these environments and by literally placing the viewer at the centre of it all, perhaps such questions become the statements: a final critique of the viewer who would sooner dismiss a question before attempting to answer it. Fierce Festival, Bennett Miller, Dachshund U.N.